The past year has been a turbulent year for everyone in the software quality and security sector, with many high-impact security vulnerabilities and software bugs keeping IT and dev teams busy throughout the year. We noticed that many companies and teams focused more on software quality this year and spent more time and resources to make their projects more robust. Various teams told us that customer expectations for software quality are steadily increasing, especially as it becomes easier for customers to switch to alternative products at any time. At the end of a year we always like to look back to review what went well, what didn’t go so well and to set our goals for the next year. 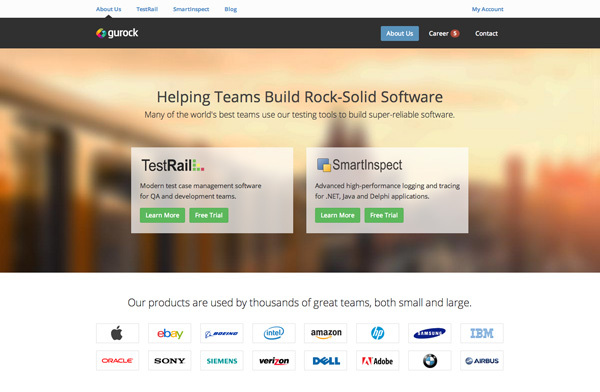 For us here at Gurock 2014 has been a great year and it was especially intense with various major feature releases of our flagship product TestRail, designing and building our improved cloud infrastructure and the release of our new website. We worked with many fantastic new and existing customers this year and look forward to continue working with you all in 2015! We list some of our major milestones of 2014 below and include a short outlook of our upcoming plans for the next year. TestRail is our modern test management tool that helps software testers and dev teams manage and organize their software tests. We have seen an incredible growth of TestRail usage this year with many new teams adopting TestRail and existing customers expanding their usage. We are really happy to see that TestRail has become one of the top test management tools and that more and more teams are making the switch. 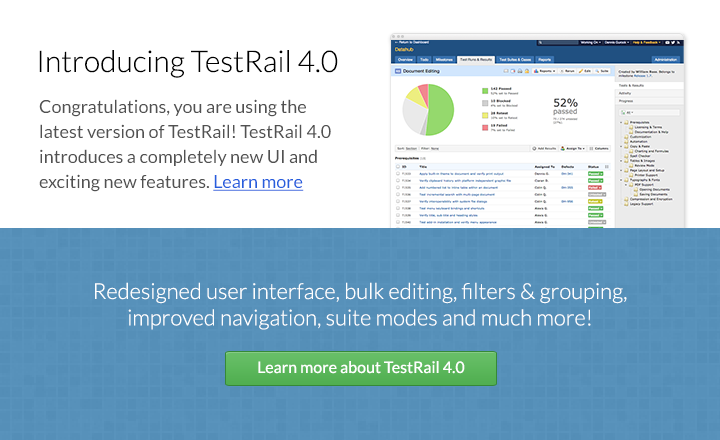 One of our main goals for TestRail is to build the fastest and easiest-to-use testing tool while still providing many advanced features for teams who need them. So we are really thrilled to see that our design efforts have been paying off as both small and large teams enjoy using TestRail for projects of all sizes and levels of complexity. SmartInspect was our first product that we released almost 10 years ago, how time flies! SmartInspect is used by an enthusiastic and loyal user base for .NET, Java and Delphi logging. Developers, testers and support teams can use SmartInspect to debug applications and to see exactly what happens under the hood when an application is causing issues or crashes. SmartInspect is a pretty mature product and we continued maintaining and releasing platform updates for SmartInspect during the past year. We plan to continue maintaining SmartInspect and further growing its user base so more teams can benefit from rich and easier to analyze application logs (and we of course use SmartInspect to build and debug all our products). We are still working on building new community, forum and resource sections; stay tuned! We have some big and exciting plans for 2015 but we are not ready to announce most of them yet. We will continue to focus on TestRail this year with multiple larger feature updates, going live with our new and improved cloud infrastructure and announcing more partnerships & integrations. Another major goal in 2015 for us is to expand our team so we can help more customers find, adopt and use TestRail. If everything goes as planned we should have some first big news to announce in this area in February. If you are interested in working with us, please see our available job postings and we would love to hear from you. To get notified when we announce some major news or release a big product update, please subscribe to our newsletter or Twitter feed below.